Imminently, the Directive 2014/41/EU of the European Parliament and of the Council of 3 April 2014 regarding the European Investigation Order (EIO) in criminal matters  is expected to become part of the EU-nations’ national laws. This EU directive requires each European Member State to transpose the directive into national law by 22 May 2017 (Article 33). This EIO describes the possibilities about lawful interception (LI) of telecommunications and collection of traffic and location retained data (RD) extended to network scenarios out of a pure national network context: an EIO may be issued for the interception of telecommunications by a Member State to obtain intercepted data of a target when using a communication service in a CSP’s network located in another Member State country (ref. Article 30 of ). From the second quarter of 2016, ETSI TC LI has started to study different LI/RD Architecture reference models to address the new EIO requirements which imply that an LEA of a country (country B) will be able to get intercepted data of a target using a communication service in a CSP network located in another country (country A) in certain circumstances. Following different technical evaluations, ETSI TC LI agreed to support such data transfer between different national borders at the LEA’s domain level without impacting the CSP interception domain implementation. They were introduced the concepts of Requesting Authorized Authority (reqAA) and Responding Authorized Authority (resAA) with the corresponding Monitoring Facilities reqLEMF (in reqLEA) and resLEMF (in resLEA). The requesting LEA or AA sends a message to responding LEA or AA specifying the data it needs. If accepted the responding LEA or AA forwards this request to the CSP. HI1 standard defined by  may be used for such order towards the administrative entity of the CSP where the target is requested to be intercepted. The CSP activates the request as a pure national request. The responding LEMF sends data forward as IRI IW and CC IW or RD IW data in (near) real time to the requesting LEMF. ETSI TC LI is working to define this latter step 5 interface by writing a new Technical Specification for Inter LEMF Handover Interface, ref. . This work has significant support in ETSI by all members types (Government, Network operators, MF/DF system providers) and it is planned to be finalized by mid 2017 to allow its implementation in several European countries. Figure 2 describes the functional diagram of this new HI which has been named “SMILE” from SMART [HANDOVER] Interface [BETWEEN] LEAs. ETSI TC LI approach is defining HI-S based on re-using existing standard HIs, e.g. HI-S for LI refers to TS 102 232 part 1 to 7  and HI-S for RD refers to TS 102 657 . For the network layer, HI-S is proposed to use public Internet IP-VPN interconnection of the involved LEMFs or network connection secured by other means. As with other standard HIs, HI-S has been structured to manage two different data flows in term of IRI and CC by defining distinctive transmission interface paths, HI-2S and HI-3S, as specified by figure 3. ETSI TS 102 232-1 & -2, -3, -4, -5, -6, -7 Lawful Interception (LI); Handover Interface and Service-Specific Details (SSD) for IP delivery; Part 1, 2, 3, 4, 5, 6, 7. ETSI TS 102 657 Lawful Interception (LI); Retained data handling; Handover interface for the request and delivery of retained data v1.17.1 (2015-12). The ETSI work to provide a Technical Specification (TS) to support the Directive 2014/41/EU of the European Parliament and of the Council of 3 April 2014 regarding the European Investigation Order (EIO) in criminal matters  had started in 2016 and was carried on during all 2017 and 2018 on all technical aspects of the new interface resulting now finalized with the publication of a first version of the Inter LEMF Handover Interface (ILHI) . 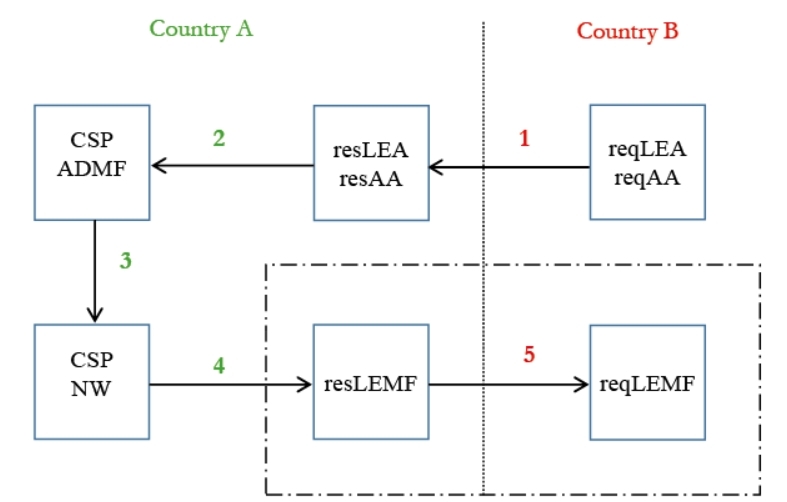 This specification provides LEMF’s with all implementation details to allow LI data transferring from one LEMF located in the country B (responding country where a target abroad is requested to be intercepted) to a LEMF located in the country A (requesting country where the request of interception is originated). NFV refers to the replacement of traditional specialised hardware devices with software that can be installed on standardised, off-the-shelf piece of hardware. ETSI work on NFV was initially set to address a requirement to define a list of base security requirements imposed by lawful interception in the NFV architecture. Traditionally the ETSI standardization work was focused on IRI and CC data details by defining, updating and maintaining related data Handover Interfaces (HI-2 and HI-3) specifications. Furthermore, ETSI had defined a dedicated Handover Interface, named HI-1, referred to be also crossing borders between countries based on corresponding international laws or agreements. HI-1 was defined as an interface between LEA and CSP to transport all kind of administrative information being used for the transmission of the request to establish or to remove the interception action from the LEA to the CSP and the acknowledgement message back to the LEA. This thematic section is intended to inform readers on the latest progress of standardization work items on Lawful Interception (LI) and Retained Data (RD) mainly focusing on European regional level (ETSI). The scope is to cover all relevant LI and RD aspects in terms of requirements, communication service providers architecture and network interfaces/protocols definition.